Hi hi hi, folks, and welcome to the most wonderful day of the year! 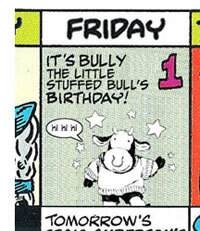 No, it's not Christmas...not National Pickle Day (that's November 14), guess again!...it's my birthday! This year I am six years old. And that's a very good age to be, I declare on the pages of my eleven-year-old blog. But even more exciting, today begins a new "A Month of..." feature, and a few days back I decided to throw the decision-making for its subject open to you, the viewer reader! Over thirty thousand of you wrote in on these real blue cards, and if it wasn't real, could I do this? (waggles blue card in my hoof) But I haven't had time to count all those and the mailman is really peeved with me, so I'm just going to take the subject from what my good pals on Twitter voted for (I also counted those of you who voted in the comments). After a rapid start that pulled "Fastball Specials" as the subject way out in the lead (so quickly that I opened up my electronic folder of saved F.S. images and started sorting through them), a focus near and dear to my heart (and tummy) eventually won: PANCAKES! Or, as Hellboy sez, "pamcakes." Don't worry if your favorite horse didn't cross the finish line first: I actually will do all of these subjects in time over the next few months. That's good news for you, fans of bitchslaps! Yep, this month, all month: pancakes in comics! 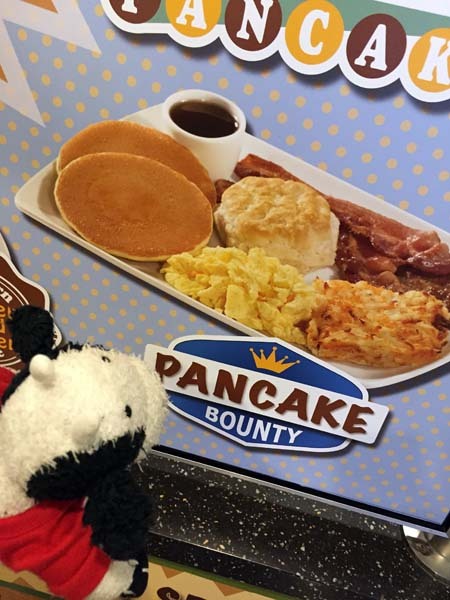 That includes flapjacks, griddlecakes, johnnycakes, and especially wheatcakes. 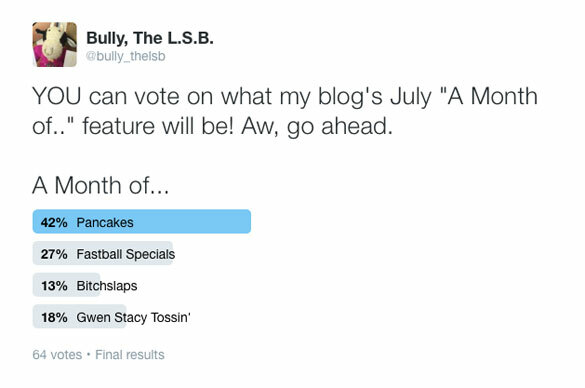 If it's round, flat, made of dough, and you can put syrup on it, you'll see it here in July! * * Does not include that time Reed Richards invented a long-playing record out of bread, upon which he recorded "Baby I'm-A Want You." 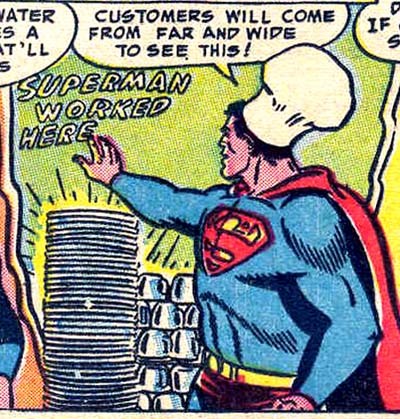 Yep, that's Superman, short-order cook. Meanwhile, Luthor has kidnapped Lois Lane and destroyed downtown Metropolis, but you just go ahead with your pancake-flippin' and your tricking Jimmy Olsen and your Stamp Day, Superman. And when you're done with that, who doesn't enjoy a dose of super-vandalizing the diner's kitchen? Sure, we all do! 'Round about now The Duke Boys were in a mess o' trouble you're wondering why the most powerful man on Earth is dishing up the blue plate special, right? Well, let's take a look at the splash page for this story. It might not be Superman #89's cover, but I'm guessing that wasn't for lack of trying. Hey, kids! SKID ROW! Kids love Skid Row. Also: this scene does not appear in the story! Nice of J. Edgar Hoover to guest star there. Turns out there's some corruption/strange doings/Kryptonite going on in Metropolis's Skid Row. This run-down area of America's Greatest City is known in modern-day parlance as Suicide Slum. Now that's a name. It certainly is unbefitting the futuristic, sunny vision you get of Metropolis, Delaware in their extensive, Superman-fixated tourist brochures. Isn't New Jersey's Gotham City a more appropriate place to have a Skid Row/Suicide Slum? My hypothesis: the aliens from Independence Day: Resurgence scooped up Skin Row from Gotham and plopped it down on the south side of Metropolis. And now you know...the rest of the story. 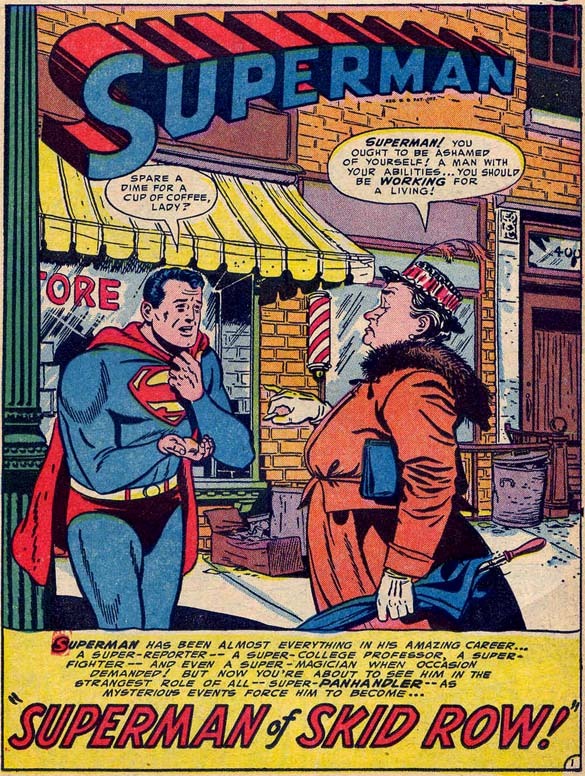 Well, pretty soon Superman susses out that it's the Skid Row...I think we're historically allowed to call them "bums" at this point in history, but let's just say "Skidrowians"...were blackmailed by a crook into operating an elaborate confidence game just to keep themselves in tinned beans, tobaccy, and bindles. (Or is that hoboes?) 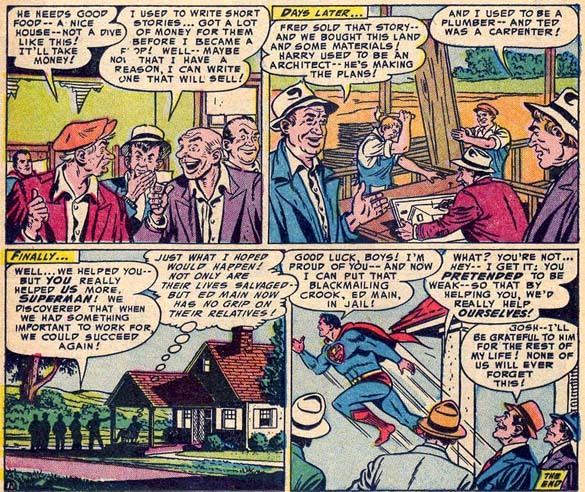 Thanks to the inspiration of Superman  whose most active role in this story was making ten thousand pancakes  the guys decide to pull themselves up again by their shoestrings and rejoin society by becoming the architects, plumbers, and carpenters that certainly were not needed prior to this point in the post-WWII industrial building society. Also: a guy who used to write short stories, and who now can tell true tales about the sordid life of the downtrodden and beleaguered. Ladies 'n' gennlemen, the DC Universe's first appearance of Mister Gay Talese. The above is a long way to say "pancakes," and certainly do contact me again by checking back tomorrow for Day Two: Waffles Pancakes! I have been sent a cease-and-desist album by Atlantic Records stating that I must not defame or disparage any individual or group member of their band Skid Row, and I have consulted by lawyer who has drafted a response of "You guys have too much times on your hands." Actually, Sol, I think that's Styx, not Skid Row. 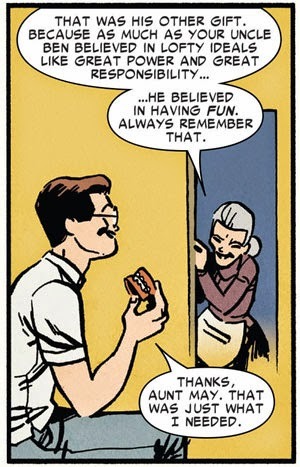 Even though it means Gwen is safe for another day, I'm glad you got what you wanted for your day, Bully. Happy birthday! "Say, er Charlie Kendall... Where do you get a gr--"
A man who is more powerful than a locomotive silently judges men who "couldn't take the disappointments that come with life"? Come on, Clark -- I know you were raised better than that. The MAD 1960 2016 calendar for Junky July!